A solid PVC Spinosaurus dinosaur model kit in 1:24 scale. Create an amazing model of Spinosaurus with a captured Xiphactinus (prehistoric fish). A wonderful 1:24 scale Spinosaurus model kit for you to assemble and paint. A PVC vinyl kit of Spinosaurus in 1:24 scale. 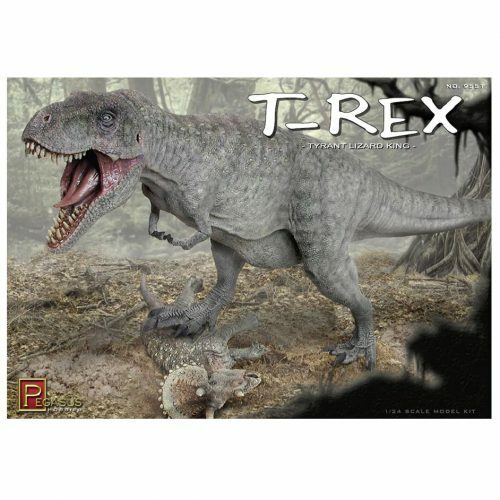 Kit includes Spinosaurus (11 pieces), prehistoric fish (Xiphactinus – 6 pieces) and detailed display base. A superb Spinosaurus dinosaur model for you to assemble and paint. Paint and glue not included. All the usual marketing hyperbole, right? But in this case, they’re well deserved. This *is* an excellent model. All the parts are well moulded in heavy vinyl, with very little distortion given their size and weight. The parts fit together very well, with tight, deep joints. I’ve only done a test push-fit of the main Spino parts so far, but the model stands on its base (which is moulded from a harder vinyl) very stably. When glued and pushed together fully, the joints shouldn’t need much if any filling. My only quibble is that the neck joint is a particularly tight fit, and I worry about damaging the head when I push it firmly home. The sculpt is very detailed (and the mould sharp with almost no discernible flash) and the pose dynamic. And Spino’s catch is vey nice model in its own right! My only serious reservation is the sail, which has an even, curved profile common to many smaller models (such as Papo’s), but different from recent paleontological reconstructions which show it as more trapezoidal and “ragged”. Nevertheless, I’m *very* pleased with it overall and look forward to putting it together properly and painting it.